Did you know that you bring glory to God by calling upon Him when you are in distress? God promised He would deliver you if you turned to Him. You deny the Lord honor that is rightfully His every time you find yourself in difficulty and you fail to call upon Him for help! There may be times when God allows you to reach a point of need so that you can call upon Him, and thus let Him demonstrate to a watching world the difference He makes in the lives of His children. If God never allowed you to experience need, people around you might never have the opportunity to witness God’s provision in the life of a Christian. If you never faced a shortfall, you might be tempted to feel self-sufficient and without any need of God in your daily life. Pride will tempt you to think that you do not need to seek God’s assistance. Self-regard will seek to convince you that you can handle your dilemma through your own wisdom, resources, and hard work. Pride will also rob glory from God and seek to give it to you. Don’t allow your pride to take what rightfully belongs to the Lord. Call upon your Lord and wait exclusively upon Him to rescue you. Then give Him the glory that He deserves. 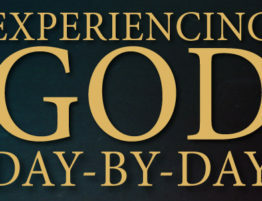 Self-sufficiency can greatly hinder your ability to experience God and bring Him honor. The next time you are in distress, turn to Him!